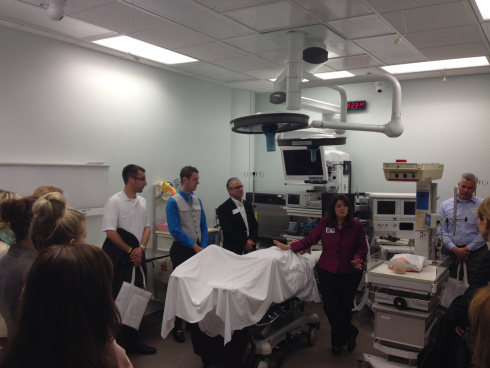 On Wednesday, May 7th, the Oakland County Medical Main Street team welcomed healthcare professionals to one of the nation’s most innovative and premier healthcare facilities. 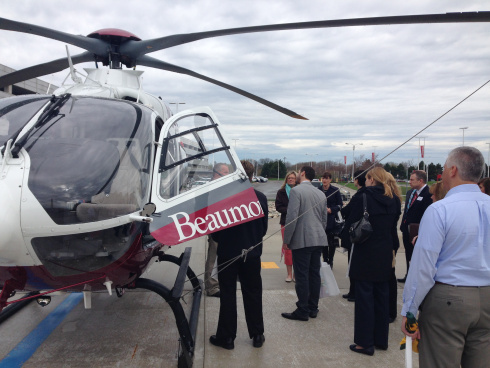 Beaumont Hospital – Royal Oak welcomed guests to a morning tour of their facilities, including an inside look at the Suzanne and Herbert Tyner Center for Cardiovascular Interventions, the Marcia & Eugene Applebaum Surgical Learning Center, and BeaumontOne (their air medical transportation service). Diane Schuch-Miller, Assistant Director of the Marcia & Eugene Applebaum Surgical Learning Center, showed attendees the vast ways in which learning is conducted at Beaumont. The Surgical Learning Center has two full-scale model operating rooms, computerized patient simulators, a surgical skills laboratory, and a classroom with the latest in distance learning capabilities. 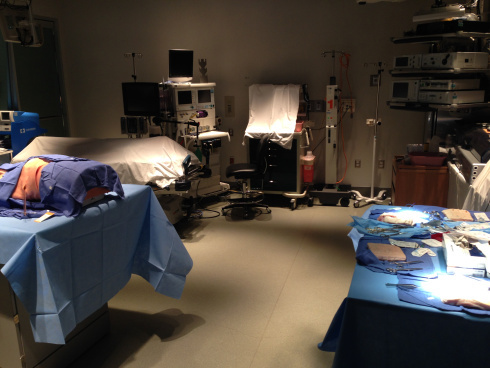 A full-scale model operating room at the Surgical Learning Center. Computerized patient simulators can breathe, speak, and have reactions much like a human being. In addition to touring multiple centers, Ken Richey, Manager of 3D Imaging Services at Beaumont Health System, discussed the importance of 3D imaging in the healthcare industry and how recent upgrades help the facility and patients save money. “A 2005 study showed that surgery can cost up to $300 a minute. 3D imaging helps save money by allowing us to look at the body in a new way. It gives the doctor a new perspective – they work in a 3D world,” he said. BeaumontOne can drastically cut travel time. A typical vehicle route from Troy to Royal Oak can take 45 minutes in traffic. In BeaumontOne, travel time is approximately 4 minutes. The tour served as a kickoff for INNOVENTION 2014: A Medical Main Street Conference, held October 21st & 22nd at the Suburban Collection Showplace in Novi. Last year’s conference brought over 600 medical professionals together for specialized presentations, breakout sessions, and networking. “We’re gearing up for INNOVENTION in October. This tour is an exciting way for us to get our network into the healthcare facilities and see the innovation happening right here in Oakland County,” Wenglinski added. To learn more about Medical Main Street, visit www.MedicalMainStreet.org or contact Rebecca Wenglinski at wenglinskir@oakgov.com. Connect with Medical Main Street on Twitter at @MedicalMainSt. ← Bloodroot: A woodland ephemeral wildflower that bleeds!